Sainte Anne Island is the largest (2.27 km²) of eight islands in Sainte Anne Marine National Park of the Seychelles, declared a protected environment since 1973. It is 4 km off the east coast of Mahé. The highest peak on Sainte Anne is 246 meters (807 feet). It’s well worth the trek to the top, although you have to climb up steep slopes albeit with the aid of a few ropes. It has abundant tropical vegetation and is home to a myriad of fish, especially butterfly fish, moray eels, sea anemones and colourful corals, with rays and turtles being frequent visitors. It’s excellent for snorkelling and diving. In the early 20th century the St. Abbs Whaling Company briefly maintained a whaling station on the island, the ruins of which can still be seen. Sainte Anne Island is a favourite nesting ground for sea turtles. The turtle egg laying season spans a period from October to January every year. Each day, three turtles on average go ashore to lay their eggs on one of the six beaches or creeks that form the shores of Sainte Anne. 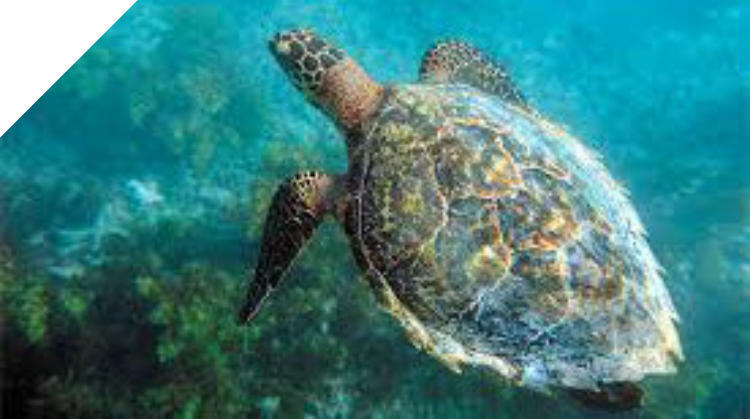 Most of them are hawksbill turtles but some green sea turtles may also be spotted occasionally. About two months later, mainly on the secluded beach of Anse Manon, baby turtles head towards the ocean for the first time. The Beachcomber Sainte Anne resort has excellent snorkelling and scuba diving or enjoy a kayak or pedal boat. There’s a choice of many free and chargeable treks. Our activities were: Friday afternoon arrival Sat – Visited Victoria on Mahe island in the morning (courtesy boat 10am, return 1pm, afternoon snorkelling Sun – 9am Hill top walk, 2pm snorkelling off Moyenne Island, Dinner Mont Fleuri restaurant Mon – 11am kayak to Round Island, then snorkelling. 3pm walk to Anse Manon. Dinner Mont Fleuri restaurant Tues – 9.30 diving, 3pm to Round Island for snorkelling off the sand ridge Wed – 9.30 Moyenne Island, 2pm snorkelling. Dinner Mont Fleuri restaurant Thurs – 10.15 snorkelling. 3.30pm departure.